Take note the East Malaysians. Malaysiakini : Fuel prices will go up across the board, effective midnight, following two weeks of decline. 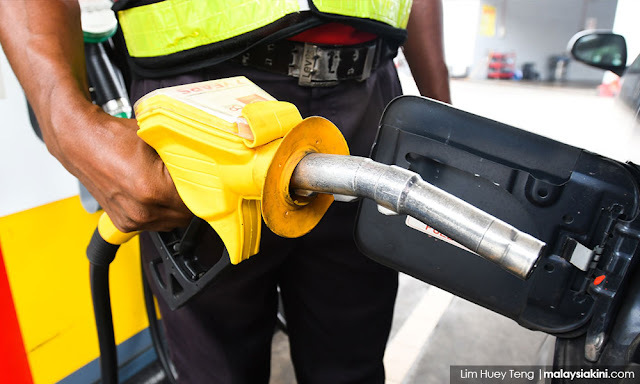 According to an announcement by the Domestic Trade, Cooperatives and Consumerism Ministry, RON95 will retail two sen more at RM2.27 per litre, while RON97 will cost two sen more at RM2.54 per litre. Diesel will cost three sen more, to RM2.23 per litre. The weekly fuel price system was implemented on March 30. It is determined by global oil prices based on the Mean of Platts Singapore and the ringgit's strength against the US dollar. The retail prices are announced every Wednesday evening, and take effect the following day.